WASHINGTON — Think your December is busy? Better check that twice, because few people keep a schedule more packed than Santa Claus this time of year. There’s the toy-making, the list-checking, the reindeer-tending, and, of course, the mall visits. Santa has been making the trek from the North Pole to Northern Virginia for nearly three decades to visit with local children (and now their children) at Tysons Corner Center ahead of Christmas. He leaves his sleigh on the roof (flying is an easy way to avoid D.C. traffic) and posts up with the missus at a local hotel for the season. This year, Santa has posed for thousands of photos while fielding requests from good boys and girls — Legos and American Girl dolls are the chart-toppers, thus far. He’s also held a fair share of infants who don’t always take to his white beard and red cap with the same excitement as the older kids. As sad as it is to see the babies cry, he said at least the parents get to take home a memorable picture. “You try to make light of what it is, but it’s the memories that the parents are looking for. Because years from now, what’s the [photo] you’re going to remember?” Santa said. But it’s not just kids who wait in line, sometimes for hours, for the chance to see the red-suited celebrity. Santa was recently visited by a local physician who wanted to meet the man whose picture was all over his office. “He said, ‘I literally have hundreds of children on my bulletin board that I have delivered, and parents have sent me pictures of them for Christmas, and you are on 95 percent [of the pictures],’” Santa explained. 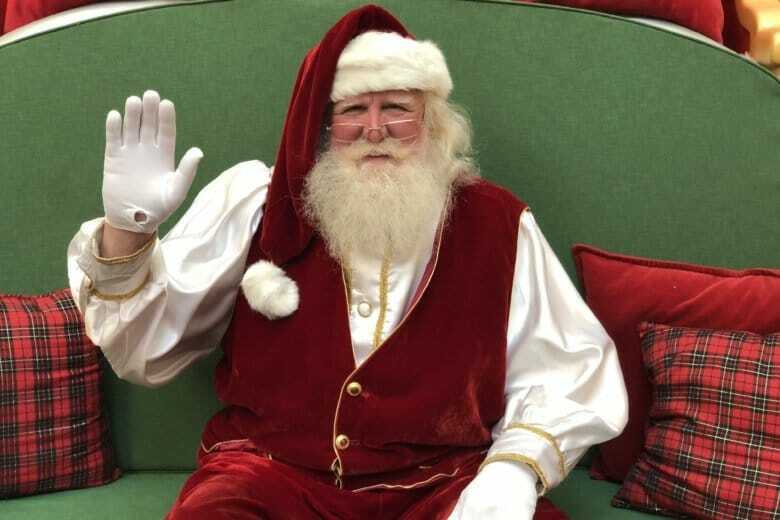 Santa will be at his first-floor headquarters at Tysons Corner Center until 5 p.m. on Dec. 24. After a busy night and a global flight, he’ll return to Northern Virginia on Christmas Day to visit children at a local hospital before heading home. In the off-season, Santa keeps plenty busy, brushing up on his workshop skills with construction and remodeling projects. But he always looks forward to his trip back to Tysons Corner Center, where he hopes to spread Christmas cheer for many years to come. “Remember why we celebrate Christmas — don’t ever let that magic go,” he said.